﻿ Daylight Saving Time - When do we change our clocks? You are now viewing Pages. Click Nodes for cloud view. See more information about elsewhere in the world. 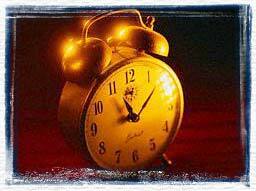 In the United States, Daylight Saving Time commences at 2:00 a.m. to minimize disruption. However, many states restrict bars from serving alcohol between 2:00 a.m. and 6:00 a.m. At 2:00 a.m. in the fall, however, the time switches back one hour. So, can bars serve alcohol for that additional hour? Some states claim that bars actually stop serving liquor at 1:59 a.m., so they have already stopped serving when the time reverts to Standard Time. Other states solve the problem by saying that liquor can be served until "two hours after midnight." In practice, however, many establishments stay open an extra hour in the fall. Many fire departments encourage people to change the batteries in their smoke detectors when they change their clocks because Daylight Saving Time provides a convenient reminder. "A working smoke detector more than doubles a person's chances of surviving a home fire," says William McNabb of the Troy Fire Department in Michigan. More than 90 percent of homes in the United States have smoke detectors, but one-third are estimated to have dead or missing batteries. > For information about world calendars, see Calendars through the Ages.